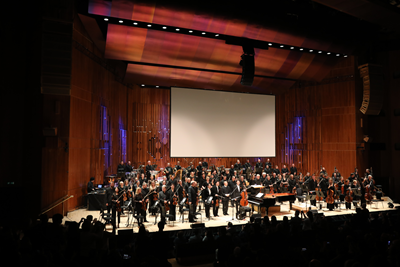 On November 30, the London Symphony Orchestra gave a performance of the Martial Arts Trilogy featuring Tan Dun, a world-renowned Chinese musician, composer, and conductor, and Violinist Lyu Siqing, Cellist Qin Liwei and Pianist Sun Yingdi, known as the "China Trio". 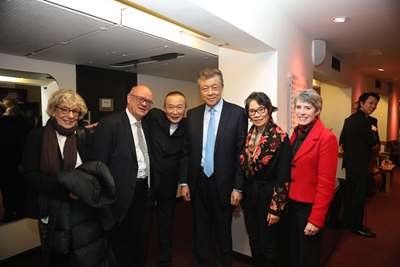 Ambassador Liu Xiaoming and his wife joined over 2,000 British audiences in the brightly-lit and fully-packed Barbican Hall. Starting in the sound of dripping water, the concert, accompanied by visuals from the three Chinese movies: Hero, Crouching Tiger, Hidden Dragon, and The Banquet, brings a selection of the trilogy's most remarkable moments to life. The music is enchanting, sometimes melodious and soft, sometimes vigorous and forceful. The unique audio-visual concert that mixed both the Chinese and Western musical instruments depicts a poetic world, finds a way in the heart of the audience, and offers a musical feast that combines the Chinese and Western elements. After the concert, Ambassador Liu Xiaoming and his wife had cordial talks with Tan Dun. Ambassador Liu congratulated him on the success of the performance, and commended him on his contribution to the cultural exchanges and cooperation between China and the Western countries. Tan Dun said that music had no boundaries, and he would remain devoted to composing new music and contributing his part to the promotion of Chinese culture and the exchanges between Chinese and Western culture.